The benefits of music on individuals with autism are widely known. Improved focus, advances in speech and language, and better motor skills. But sometimes it’s about the growth that you can’t quantify in numbers. On a Tuesday night in a sleepy plaza in Penfield, the Music Education Center is buzzing. Kids are in the waiting room, parents are catching up and students are practicing anything from trombone to piano. Noah Svokos is a curly haired 13 year old who has been taking piano lessons for 5 years at the center. 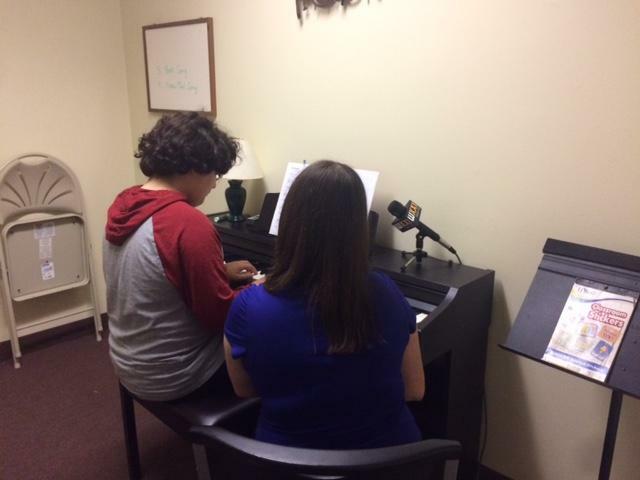 The facility is open to anyone but they have a focus on adaptive music lessons, for individuals with disabilities. Noah’s dad Tony Svokos brought him to class, and said over the years he’s seen his sons confidence grow, his memory get sharper, and he can remember notes and song titles and adapt these skills to his day to day life. Tony says places like this center are essential. A lot of Noah’s classmates have grown up around kids with autism Tony says, so they don’t treat them any differently. The music education center started in 2004, co-owner Sarah Jamison tells me. As a graduate of the Crane School of Music at SUNY Potsdam, she never really pictured her career going down this path, but the students kept her coming back. by Rob Price via the Business Insider. When I was about seven or eight, I went for a taster violin lesson at school. The idea was to get an idea for the instrument, and see if I wanted to learn properly. I enjoyed it — but the expected lessons never materialised. A few years later, I asked my mother why: Apparently the tutor had refused to teach me. It’s fair to say that I am not a natural musician. But at the start of 2016, I resolved to change that. I decided to learn the piano. It was a year of immense frustrations, and deep satisfaction — and endless Philip Glass. It expanded my horizons, and forced me to confront my failings head on. And for that reason alone, I’d recommend it to anyone. I’m 24 years old, I live in London, and I’ve gone through life without knowing the first thing about music. I love to listen to it — I’ve got a pretty big collection, and I go to gigs regularly. But how it’s made has always been one great big opaque mystery to me. I wanted to challenge myself. 2016 was the start of my third year living in London. I’d settled into a routine, and wanted to add some variety to my life — and something that would push me in a new direction. I wanted to do something totally new. 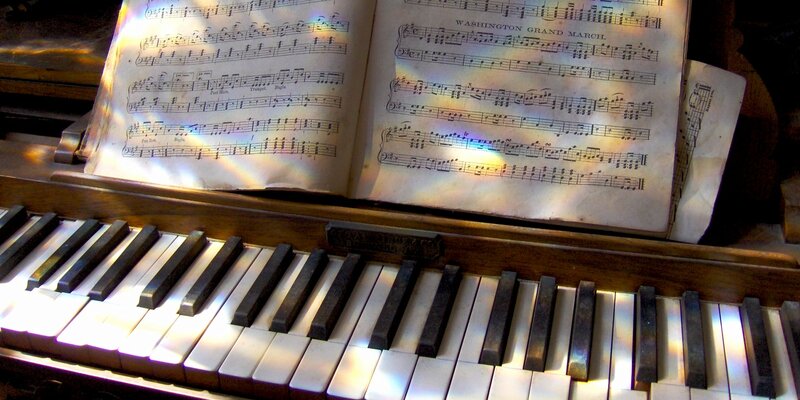 Learning music for the first time isn’t like taking up a new team ball-sport, or an unusual arts-and-crafts activity. Music is an entirely new category of human endeavour I have never meaningfully engaged in before. That makes it pretty exciting — and intimidating. I love music. Pretty self-explanatory. I hoped that learning an instrument for the first time would enrich my appreciation of the artform. I also set myself a few goals — some strict, and some more nebulous. Pass my Grade 1 piano exam by the end of 2016. If you’re not familiar with the system, you can take exams as you learn instruments, from Grade 1 through to Grade 8. A clear target of reaching Grade 1 by the end of the year would give me something to work towards, a way to measure my success or failure. Improve my knowledge of classical music. I had no strict timeframe for this, or a set point when it would be “completed.” But I’ve never known my Bach from my Beethoven, and I wanted to change that. Learn “Metamorphosis II,” by Philip Glass. This was a longer-term goal, beyond 2016 — it’s a beautiful, flowing, and technically tricky bit of music that I wanted to work towards as I got better. How did it all go? The short version is that it was fantastic — I’m extremely glad I did it, and I’d strongly urge to anyone thinking about taking up an instrument to do it, whatever your age. It wasn’t all plain sailing, however. Note: The following sections go into some detail on what and how I learned. If you just want to know whether I passed the exam or not, skip down to the “arcane mystery” section below. Let me make this clear: Piano is hard. Really hard. It requires you to think in a way you’ve never done before, juggling a thousand balls simultaneously. Interpret the music. Keep the tempo. Vary the volume. Move both hands independently of one-another. Make sure it all actually sounds good. You know that brain-straining feeling when you try and multiply three three-digit numbers together? That’s what it felt like to be interpreting and playing music on the fly. I think we went to sleep while posting this. If you’d like to put your baby to sleep with the warmth of piano music, learn how to play today at Jordan Kitt’s Music School! It’s never too late to learn piano! 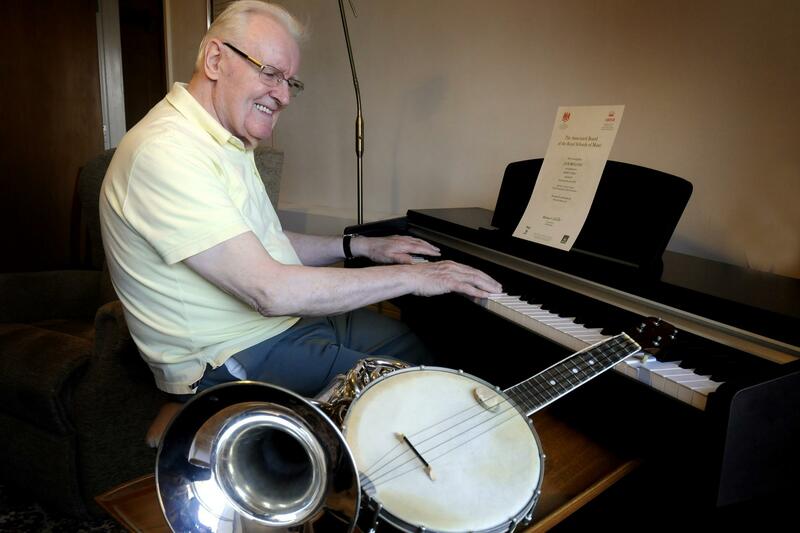 IT took him three attempts throughout his lifetime to start learning to play but a Ryfields Village resident once christened ‘The One Man Band’ has now passed his grade one piano exam aged 86. Jack Skelland says he tried to learn to play in the 1940s before a second attempt in 1984 and now hopes it will be third time lucky after starting lessons with tutor Ralph Wheatley in March last year. Jack added: “When you’re younger you get involved in other things and I had to cut my lessons short in 1984. “I got the piano a year after moving into Ryfields five years ago and just thought if I don’t learn now I never will. “I wanted to have a go at an exam but thought I had made a mess of it. Jack, who puts his love of music down to his mum singing around the house, admits his first love was the drums playing in a jazz band at The Cherry Tree in Culcheth. He says ‘domestic matters’ lead to him selling his drum kit before he played the trombone with the Warrington Silver Band in the 1960s, had lessons to play the clarinet, the tenor horn and joined the George Formby Society playing the ukulele. Jack, who started out as as an apprentice compositor at James Wood on Sankey Street in the 1940s before a number of different jobs and eventually retired at Risley Atomic, said: “It feels great learning the piano but I just regret now I didn’t stick with it earlier. “My heart wasn’t in it then but I wish I had gone for a career in music looking back over my life. “I used to be a bit of a square peg in a round hole but I want to do as many grades as I can now as you never know how long you have got left. Tutor Ralph, 53 and lives on Manchester Road, said it had been a ‘pleasure’ teaching Jack. He added: “After the lesson, our roles reverse and Jack educates me in music and puts some of his big band records on. “I’ve taught around eight other members of his family but in 35 years of teaching I’ve never had anyone of Jack’s age come to me. Or learn more about piano lessons for all ages here! Posted on January 7, 2016 January 13, 2016 Author PJ OttenritterCategories Piano Lessons, Piano NewsLeave a comment on It’s never too late to learn piano!